Creatively decorate spaces with beautiful live flowers and foliage displayed in the eco-conscious style of planters from the Beacon Hill Series. Mimicking a traditional lumber look, these upscale planters are designed with horizontally or vertically positioned recycled plastic planks accentuated by its powder-coated aluminum frame. Converse to natural lumber the recycled plastic is impervious to moisture and won't fall prey to rot or corrosion. 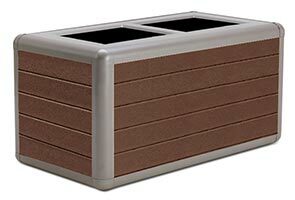 Convenient, accommodating and virtually maintenance free the Beacon Hill Series of Planters come standard with a lift-off top, center divider, 2 individual plastic liners, 1/2" pre-drilled base holes and adjustable rubber leveling feet.